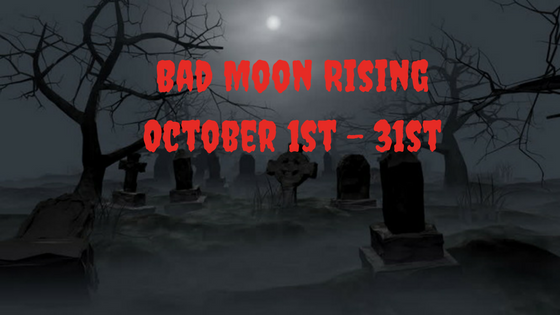 For the month of October, Books & Such will again be featuring Bad Moon Rising, 31 days of horror/thriller writers! If you’re an indie author of horror/thriller books, and would like to be featured, send me your info. This is an opportunity not only for free publicity and book sales (hopefully), but also to crawl out from under your colossal TBR piles and buy more books! Each post will feature one of your releases, a blurb, author bio, contact links, buy links, and a short interview. If you’d like to include a giveaway or have alternative ideas for your post, I’m open to suggestions. This is the third year of Bad Moon Rising and spots tend to fill up fast, so if you’d like to be included, email me at tpolen6@gmail.com. Looking forward to another year of Halloween happenings, Teri! Always an exciting time of year, Mae. This is awesome. Looking forward to it! So am I – more books for the TBR! This is exciting, Teri! Bad Moon was such a hoot last year. Since you kindly used it last year, I could draft up something about Lilith, how I almost made her a mouse rather than a cat, and a snippet of her part in Book-2. It would be more of a “writing process” post. If that sounds good to you, just let me know. Hugs. Absolutely – anything for Lilith – and you, of course, Teagan! I’ll send you the date. Reblogged this on Rose English UK. Yay, I was hoping this would come around again. And you’re also scheduled, Craig. Just an indie author with a published horror/thriller book.